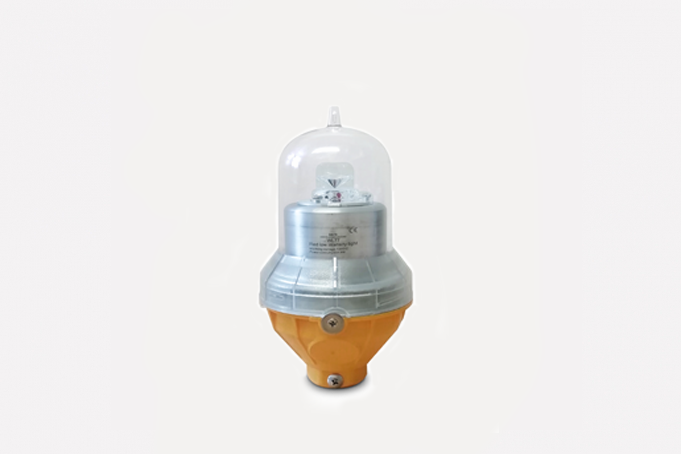 The WL77 Single Aviation Obstruction Light is designed for marking Towers (Telecom, GSM), Cranes, Hoists, Chimneys, Buildings and any other potentially hazardous obstructions to air traffic. The enclosure of WL77 is made of die casting aluminum with yellow colour powder coated finish. This gives the advantages of being lightweight, waterproof, shockproof and corrosion resistant. Base cable entry is available giving ease of mounting and maintenance. A steel wire is used to connect to the base to protect against falling during operation and maintenance. The light source consists of external long life LEDs, to ensure maximum life of the product. Use of a Fresnel lens for even distribution of the light and ensures the light beam is in the scope as required. Based on LED technology for low power consumption and high efficiency. Lamp housing – Polycarbonate cover with good anti-impact strength, thermal stability and high transmittance. Die casting aluminum base with yellow colour powder-coated paint finish (available in red also), provides corrosion resistance and durability. G3/4”pipe available separately for ease of mount. Self-contained compartment, with stainless steel wire which is used to secure the unit against falling during maintenance. Built-in photocell can switch ON/OFF the light at dawn and dusk (optional). Steady burning or flashing type (no need external controller).